Our patented, electrically heated screw conveyor is made for industrial bulk materials processing: heating, roasting, drying, and many more. Spirajoule® is a dedicated equipment for a continuous thermal treatment, based on a hollow shaft screw conveyor heated by a low voltage current. The screw is made from electrically conductive material and is connected to an electricity power supply. Electricity is conveyed from the power supply by the specially design components located at both sides of the screw. The passage of electronic current through the conductor (screw) generates heat, which is as a result of Joule heating (also known as Ohmic heating or resistive heating). The temperature of the screw is maintained due to the joule effect and precisely controlled by the regulation of screw temperature setting. The product that enters the pyrolysis chamber is conveyed and remains in the continuous contact with the heater while it is being transferred. The particles of feedstock are therefore heated in an uniform manner while passing through the reactor. The residence time of treated material is regulated by setting of screw rotation speed. 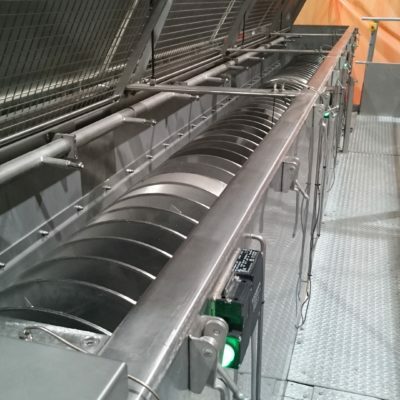 Thanks to its features, Spirajoule® is an equipment proposed in for all types of bulk products treatment: from food industry, through chemical, petrochemical, up to the waste industry sectors. The electrically powered screw heater provides accuracy and efficiency not achievable by other means. The temperature of the screw is maintained due to the joule effect and precisely controlled by the regulation of screw temperature setting. The product that enters the pyrolysis chamber is conveyed by the heating screw, by which remains in the continuous contact with the heater while it is being transferred. The particles of feedstock are therefore heated in an uniform manner while passing the reactor. The residence time of treated material is regulated by setting of screw rotation speed. Spirajoule© technology is a simple and economical process with accurate and efficient operation for the heat treatment and valorisation of bulk products in wide range temperatures up to 850°C. ETIA provides it solutions to more than 35 countries in five continents. 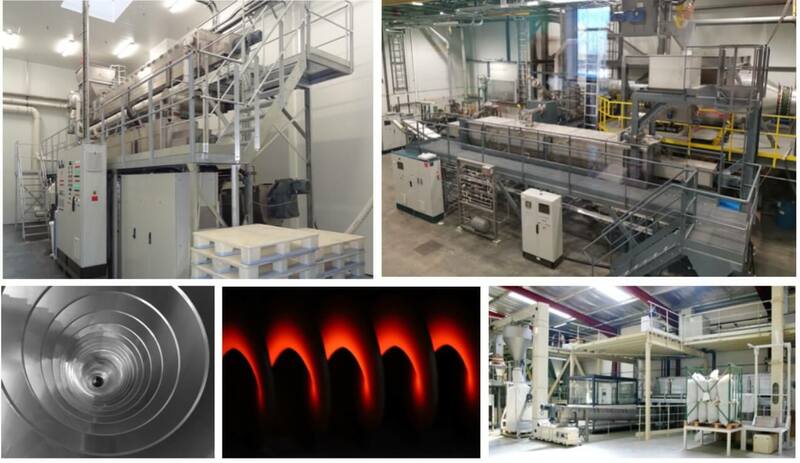 Company portfolio covers more than 150 delivered units, among which high temperature processes over 550 deg C. include more than 40 machines operating on different feedstock worldwide. As a company with wide experience with thermal treatment, ETIA has installed worldwide a multiple systems for the thermal conversion, debacterisation, continuous sterilisation, energy and products valorisation as well as mineral treatment. From heating, roasting and sterilisation of the food products, up to the biomass and residues valoristation and minerals treatment. Learn more about the typical applications of the Spirajoule® in the industry. If you are looking for components for the thermal treatment of your products – contact us and discover our offer in details.